"Martin Luther was a German fellow who pinned a note on a church door that said, 'Hang on a minute!' Actually, he was German so, 'Ein minuten bitter!'" I honestly can't remember the first time I experienced the comedy of Eddie Izzard, but ever since I discovered him, I've been continually impressed with his output. 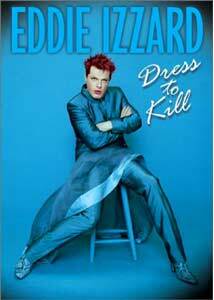 In the US, Izzard is not terribly well known, despite some massively popular performances, including one in San Francisco featured here on Dress To Kill. His few film roles haven't really been enough to spark any massive interest either. This, in my opinion, is a shame given that he's probably one of the most brilliant comedians of our time. After the huge stand-up comedy onslaught of the 1980s, I don't think the world of comedy has ever really recovered. Stand-up still lacks a certain conviction, and many comics nowadays subscribe to the philosophy that louder and cruder equals funny. What surprised me about Izzard was that he managed to be uproariously funny, yet almost completely avoided the standard club routine by using topics usually thought of as comedy killers. Who would have thought that subjects like the history of religion in Europe would work as a routine that would bring a huge crowd to applause? Dress To Kill is Izzard at his best, doing an amazing, breathless 2-hours worth of material to an American crowd that likely weren't expecting jokes about the intimate details of European history and politics. While much press time has been spent on Izzard's penchant for wearing women's clothes while doing his routine, once you've seen him in action, you wonder why anyone would care what he's wearing. Izzard could don a garbage bag and still focus strictly on the comedy. What makes him so funny is that he abandons so many typical elements of the stand-up genre. In doing so, his relaxed nature gives him amazing power to flit from topic to topic without sounding rehearsed or coming up with lame excuses for certain routines. Fans of this kind of unusual blend of intellectual and basic comedy (Monty Python's Flying Circus comes to mind) should easily find Izzard likable. If there's anything negative about his act it would be that, unfortunately, his brilliant humor is left to adults, thanks to the language. This is a shame, as the themes and topics are not remotely mature and could be appreciated by anyone. Still, he's far less extreme than many other modern comic personalities, but he gets away from himself every now and then. This doesn't remotely kill the effect of this amazing show; one of the best comic performances in memory. Image Transfer Review: The entire show is Eddie Izzard on stage in 2 or 3 different levels of close-up. Obviously, there isn't a lot going on visually, so the transfer doesn't have to go far to be good. That said, though, I think the color could have been a bit tighter, as there seems to be just a bit of bleed here and there. Other than that minor issue, though, this is a solid, artifact-free image that delivers the clarity of the live performance. Audio Transfer Review: Dress To Kill is entirely dialogue, so obviously the audio need only be clear and understandable, which it is. There are no directional effects or anything in that vein, unless you count the occasional stereo swelling of audience cheering and applause. Extras Review: There are basically three extras to the disc. The first is the addition of one hour's worth of footage of Eddie Izzard performing Dress To Circle in France—in French. The humor is a little different from the final evolution of the show (which became the main performance), but it's a nice addition to the disc and it's interesting to see Izzard perform familiar routines in French, as opposed to English. There are English subtitles as well. Second, we have commentaries for both the main feature and Dress To Circle, both provided by Izzard himself. He basically critiques his performance and discusses from where he got his ideas and how the jokes are changed in his more recent performances. It's good comedy, but suffers from a problem that many commentaries suffer from: the audio level on the original program is simply too high, and clashes badly with Izzard's external track. Finishing things off is a photo gallery of Izzard's trip to San Franciso, stylized so as to parody the work of documentary filmmaker Ken Burns. While the main menu has triple language selection (English, French, Spanish), it should be noted this only effects the menus. Why it took so long for a video release of this made-for-cable special I'll never understand, but it's extremely popularity speaks for itself. Eddie Izzard functions as a pleasant alternative to those tired of toilet humor and/or unoriginal topics as the source of the usual stand-up routines. The extra features make a nice bonus on what would otherwise still be a worthy-to-own project.